As an ex-pat American living in Scotland, peanut butter and jelly is something I occasionally have a hankering for. It must be in my DNA. I can’t say I give into that craving very often, but when I do I have to say that it is not on nice seeded whole meal bread, or using posh jam. If for whatever reason I need to buy white bread – for Christmas stuffing, or bread and butter pudding – I always nick a piece. I then proceed to smear it with a good quarter inch of peanut butter, top with a crimson dod of Lidl morello cherry jam, and fold in half. Then I proceed to shove it in my gob with two hands, like a ravenous toddler. Again, a childhood/DNA thing. With today’s recipe I think I may have grown up. A bit. Banana bread is a funny thing. We tend to call it bread but I define bread as something with which to make a sandwich. I don’t ever recall fancying a sandwich made from banana bread. But, add in a filling for a sandwich and I get really confused. Is it now a proper bread, or is it still a cake? No matter, it tastes great. I hope you agree. My non-US readers might be a bit bemused, but I hope you may also be intrigued. Because this is something firmly in the treat camp I won’t go all nutrition nerd on you and say how bananas are a great prebiotic food, or how vital nuts are to heart health. If you want health benefits of these foods, eat them as whole foods, not tasty baked goods. Banana bread is NOT a serving of fruit. But homemade cakes/breads such as this are absolutely fine when eaten in modest portions and as an occasional treat. I know, easier said than done. I was going to post this next week and give you a whole week of Tofu Shawarma (! ), but I saw that Nazima, the lovely blogger behind Franglais Kitchen, and Laura of How To Cook Good Food were doing their joint One Ingredient Challenge on bananas this month. 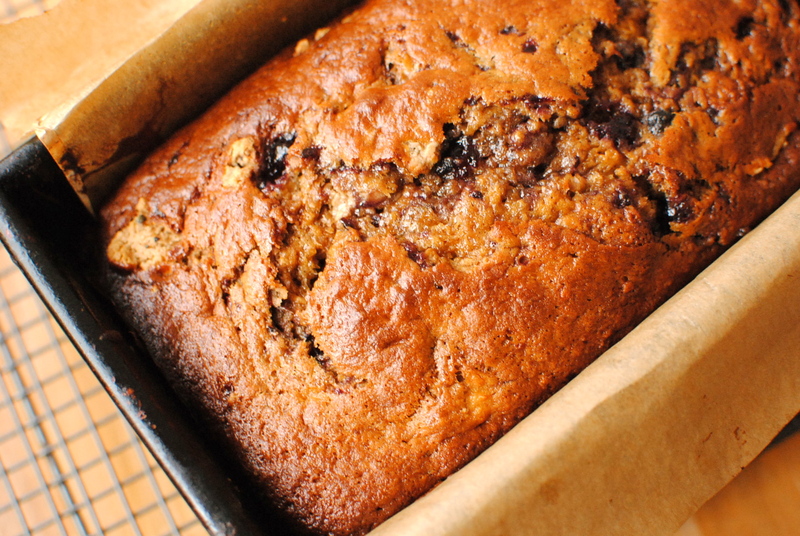 And of course the world needs another banana bread recipe. LOL! I’m sure I will find other banana ideas for this favourite fruit over there. I couldn’t get the ‘proper’ link to work so please go their respective blogs and see who’s going bananas over there! I am also popping this over to Mark of Javelin and Warrior’s Made With Love Mondays, which features from-scratch, made with love recipes. Thanks for these round-ups y’all! So, what do YOU call banana bread? Loaf? Cake? Bread? Does it matter? What are your best tinkerings with this stalwart of the cake stand? 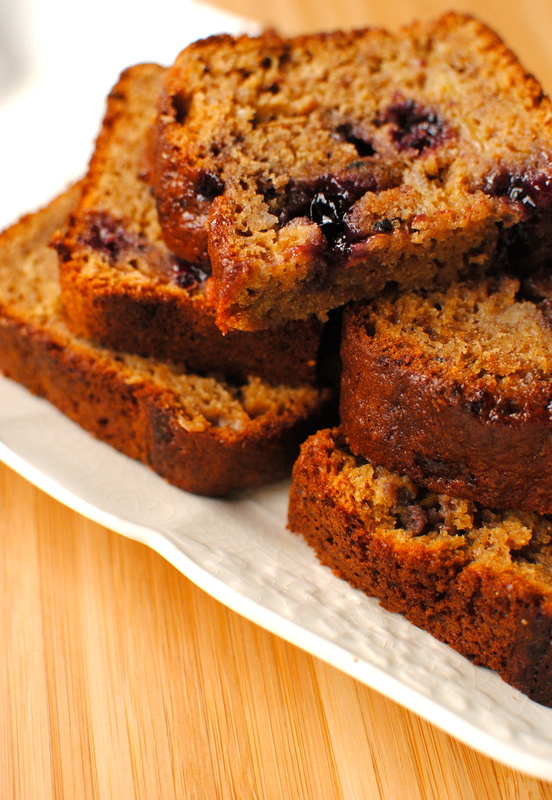 Banana bread needs no introduction. Anyone who buys bananas will probably have knocked up a version at one time or another. I’m not overly keen on raw bananas (Mr A says ‘dear diary’ whenever he sees me eating one), but stick the brown-flecked ones in a cake and I’m not so sniffy. The ‘plain’ kind is just fine and dandy, but add a few other ingredients and you can have something else altogether. I sometimes add chocolate and cardamom, or figs and Brazil nuts. But I had a bit of a minor brain wave recently, and this is the result. I have used jam – the blackcurrant one from Lidl is really good for shop-bought jam– but use Concord grape jelly for an American accent. Or any kind of jam, jelly or even marmalade you fancy – homemade if you can stretch to it. And, in truth I was almost out of peanut butter so combined what I had with cashew nut butter. This is a proper storecupboard effort and all the better for it. PS This is easily made gluten-free and egg-free, although I haven’t made it this way yet; see below. Grease a 2 lb/1 kg loaf tin or a square baking tin and line with baking paper. Preheat the oven to 180C/160C fan/350F. Use an electric whisk to mix the oil, eggs and sugar in a large mixing bowl until it is thick and leaves a trail when the beaters are lifted. Or mix vigorously by hand. In a separate bowl mash the bananas; mix thoroughly into the wet mixture. Sift or whisk (with a clean balloon whisk – this is what I do) the flours, baking powder and salt, then fold the flour into the wet mixture. Mix until just combined. Pour half of the mixture into the lined tin, dot with half of the nut butter and jam. Pour over the remaining batter and dot with the rest of the nut butter and jam. Take a knife and drag it through the mixture to marble the jam and nut butter with the banana bread batter. Bake in the preheated oven for an hour to an hour and 20 minutes, or until a skewer inserted in the middle comes out clean. If you are using a traditional cake tin rather than the loaf tin, check the cake at around 45 minutes. You will probably need to cover the banana bread for the last 20 or so minutes so do check that it it’s not browning too quickly. The jam that peeks through the batter accelerates the browning. Cool in the tin for 10 minutes then remove from the tin and cool completely on a wire rack. Cut into 10 slices and half these to make little bars. Freezes well: cut into individual squares and interleave with baking paper before freezing in a suitable container or in foil. Serves between 10 and 20. Natalie, I don’t think you would need a Vitamix to make nut butter. I find that pre-soaking really helps to blend it down to a manageable paste, adding in a little rapeseed oil if needed. Cashew goes especially lovely and soft. I admit to being lucky that we here in the UK have a number of companies that do decent nut butters, so I tend to go the easy route. Perhaps you can bulk order some online? I may have to investigate these cashew ‘cheeses’. Do they have nutritional yeast for cheesiness? Great recipe. My kids would love this. I would call banana bread a loaf. I like the sound of this and I may just have someone slavering already at the thought of it! This looks amazing! I always call it banana bread but I think banana loaf is more appropriate. Like you said, I think of bread as meant for sandwiches and while the idea of a banana bread peanut butter or cream cheese sandwich sounds pretty appetizing, it’d probably be too rich! This looks awesome! I love PB&J. Best American sandwich ever! I can just imagine how good this tastes. It’s funny the things we all have fond memories for in food. I do think there is a place for that plastic white bread but my tastes have changed so much that I do think I would dare to say I could even prefer my PB with a nice nutty loaf! Wow, that looks fantastic. Peanut butter wasn’t part of my childhood, but ‘pieces and jam’ not the ‘jeely piece’ of the Glasgow tennement but that thick plain Scottish loaf that was more reminiscent of real bread than the pan loaf, slattered with butter and my mum’s homemade jam. The gob-stuffing must have crossed the Atlantic and then come back again though!! Am bookmarking this loaf, because it looks and sounds so good. Coming from a supremo baker such as yourself I am deeply chuffed. Now you are making me hungry for pan loaf though, with its over-browned chewy crust! and a cup of tea! nice! nice! nice! 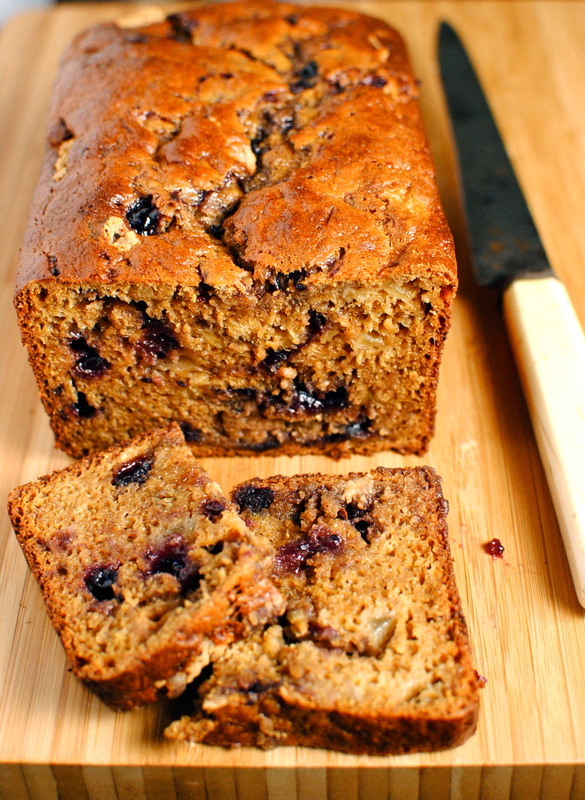 What an irresistible Banana Bread! Combining nut butter and jam can only lead to a good thing! I am always stumped for new banana recipes, thanks for sharing! I bet your Dad is counting down the days till he can have a slice of that! I don’t think I could trust myself with a loaf in the house but I may need to make it for a party or something. Yum. I am visiting in April so I wll be sure to it it then. He always has ‘on-the-turn’ bananas hanging around! But that’s Florida for you. Thanks for stopping by Alyssa. What an inspired idea and it looks scrumptious! I’m the same, I cant eat ‘raw’ bananas but love them in baking so this is one I shall try for sure. Despite being 100% Scottish I have that peanut butter thing too, yuuuuum! I didn’t know you were a fellow raw banana refusenik. I will eat them if I feel a need for potatssium boost (from a rare flurry of instense exercise say). And I hate banana flavoured things even more – milkshakes, flavourings etc. Just no. 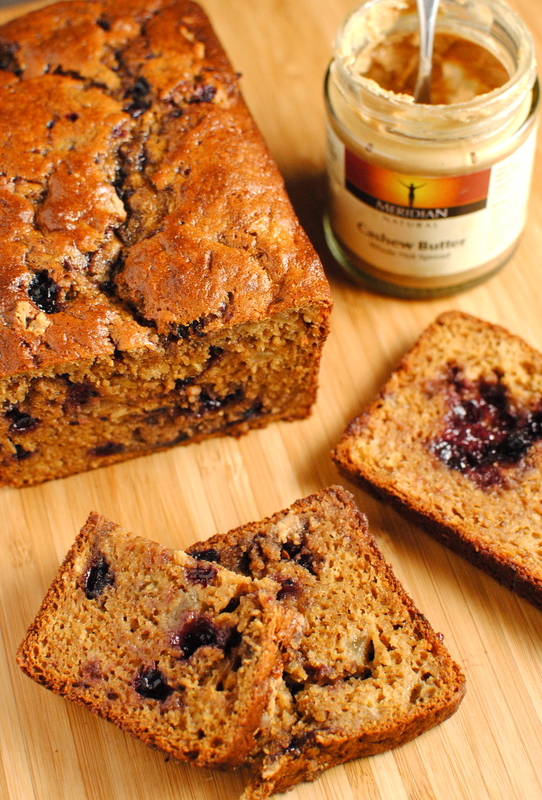 Banana bread is a rare exception and I really like it this way best. Nostalgia as well as taste. This sounds so good, because Peanut Butter is so delicious! I’ll have to give it a try. I so love any and all homemade banana breads – so this one will be on the Gotta Try It list…my Dad’s b’day is today, so Happy Birthday around the world from Atlanta, GA to your Dad!! Oh man, this looks soooo good. I’m with you on the whole banana bread being cake situation, and on the peanut butter as a treat thing. Though for me it is slathered on a whole grain seedy bread. 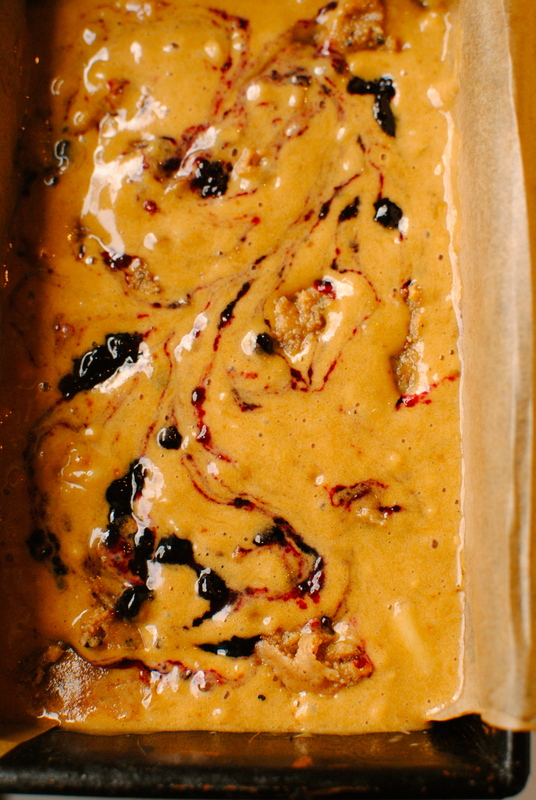 I love the idea of marbling peanut butter AND jam through this banana bread. Seems so decadent, and so obvious. Once I had the idea and made it I googled and found a few other folk doing similar, but they mixed theirs in which I imagine diluted the taste a bit. I liked the idea of hitting little pockets of jam or bursts of nuttiness. Decadent all the same but at least it is all honest ingredients. Say cake! I know it is not for everyone, and I do think it is a bit of a cultural thing. Looking at it objectively I can see that it does look a bit of an odd combination – the pb and jelly/jam that is. But marbled in to a cake is quite different to the somewhat textural weirdness of having htem on top of each other on plain bread. PS for some reason your address gets caught in my spam filter so there is always a silly delay before you are approved. I don’t know how to sort that out. Do you? I love this idea! I already made a recipe for PB & J yogurt but this is way better ! My children used to love fried bananas and peanut butter on banana bread as a sandwich. How funny. The pb and j is a great addition of flavor thank you for sharing. I guess only children and Elvis can get away with fried bananas. My hips got wider as I read your comment! Do those kind of spreads work in baking? I’m not a huge fan of margarine. I’d rather have a smaller portion of something with butter in or coconut oil. But margarines are much better than they used to be. I guess it’s just what one is used to. If you make it with lower fat margarine please tell me how it turns out. I’d love to know. Thanks for your tip. The I can’t believe it’s not butter is a great substitute for butter and cooks well in all the recipes that I have tried. Thanks for this Tammye. We don’t have ICBINB but it’s good to know it works for those who can get it. Have you ever tried Earth Balance? It’s another one we don’t have but I hear good things about it. It is a toss up between the cherry and the blackcurrant, although I like to make my own blackcurrant and raspberry jam in the summer. But it never lasts until this time of year! Fab recipe, and I love the idea for this PB and J variation. So pretty as well as delicious , thanks for linking to one ingredient! I freely admit it doesn’t take much but I’m confused. Why are baked things not a serving of fruit/veg. Like you’ve said this wouldn’t count as a serving of fruit so does carrot cake not count as a serving of veg? Why is that? There’s not enough banana in a typical portion. Portions are generally about 80g. Good question so thanks for asking. I’m sure others wonder the same thing. 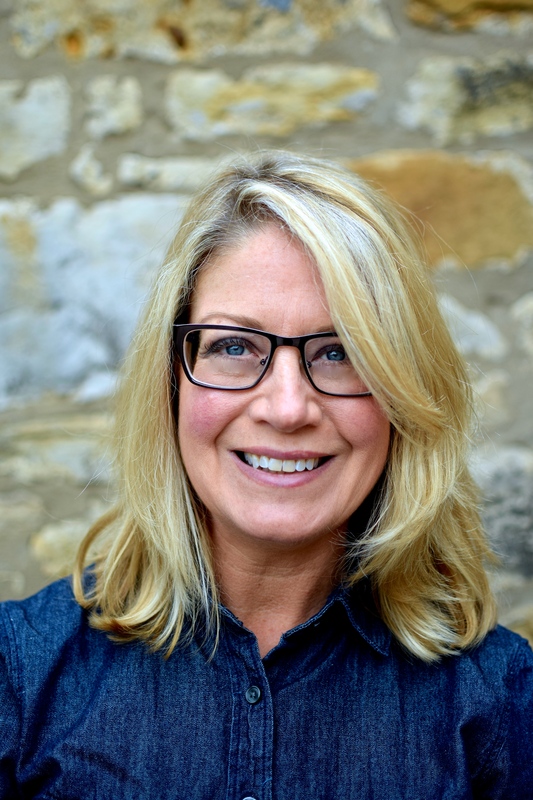 I just had to reblogg and share it with my readers! its simple yet looks full of flavor! Gr8 recipe! Will be trying it this weekend! Will post the result…fingers crossed! Ooh this look fantastic! Trying this as a lunchbox alternative. How creative! Love the idea of PB&J bread. Great post! You’re a genius! This looks gorgeous! ← A New Way To Enjoy Shawarma – with Tofu!